The Challenge: Antibiotic-resistant microbes. Conventional antibiotics, operating through single microbial mechanisms, can be evaded by mutations — which appear by chance and propagate through natural selection. This process has greatly accelerated in recent years as some antibiotics have been overused in human patients, and also introduced into animal feed. The result is a looming crisis, as new microbial strains arise and the weapons to combat them weaken. 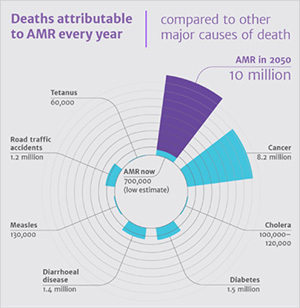 A December 2014 UK government study estimated that deaths attributable to antibiotic resistance will soon exceed those from cancer and diabetes combined (see adjacent figure). Riptide's engineered peptides are one logical solution. Unlike conventional antibiotics, the RP peptides work through electrostatic attraction to microbes' cell surfaces. Bacteria, fungi, and infectious protozoa have evolved over eons with negatively-charged surface membranes. They can't "mutate around" the activity of RP peptides without major changes in structure. Riptide has systematically enhanced the activity of Host Defense Peptides, resulting in groundbreaking levels of efficacy. 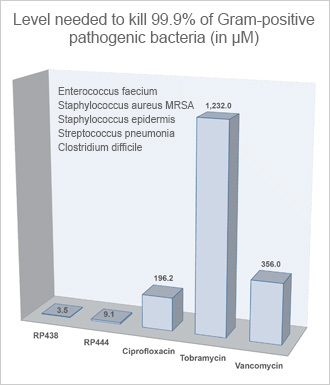 In the figures below, the antimicrobial effectiveness of two RP peptides is compared against that of three commonly-used antibiotics. 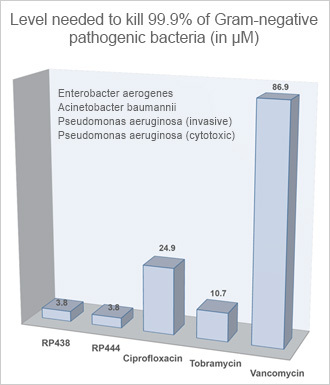 RP peptides work at concentrations much lower than the antibiotics, against both of the two major classes of bacterial pathogens ("gram-negative" and "gram-positive"). Also, RP peptides readily penetrate the "biofilm" exuded by many bacteria, which resist penetration by many conventional antibiotics. Riptide is already developing promising drugs to be used in wound and burn recovery and topical infections, supported by competitive grants from the National Institutes of Health and the Department of Defense. We anticipate early and significant applications in diseases such as keratitis, cystic fibrosis, and diabetic ulcers.